• Dealing & improving existing HR procedures & formats. To deal with multi cultural employees. • To supervise time office management & payroll. • Transport management of the construction site. • To support daily routine task & administrative needs of construction team. • To deal in all administrative & HR functions of the construction site. • Accommodation & Labor Camp Management. • To supervise & plan daily tasks. • Co-ordination with regional head office. • Maintain employee’s personal files and records. Should have minimum 6 to 8 years of experience in the field of Administration & Human Resource. Bachelor of Business Administration / Master in Business in Administration is an advantage. Must have an extensive understanding of construction industry. Good verbal & communication skills. Administration & Human Resources Management. 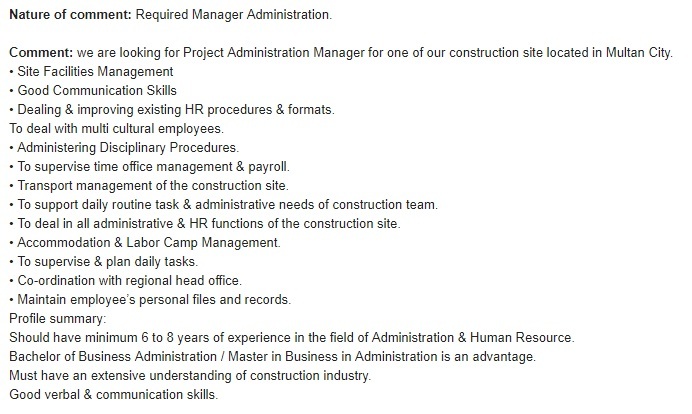 we are looking for Project Administration Manager for one of our construction site located in Multan City. Site Facilities Management Good Communication Skills Dealing & improving existing HR procedures & formats. To deal with multi cultural employees. Manager Administration Required, Administering Disciplinary Procedures. To supervise time office management & payroll. Transport management of the construction site. To support daily routine task & administrative needs of construction team. To deal in all administrative & HR functions of the construction site. Accommodation & Labor Camp Management. To supervise & plan daily tasks. Co-ordination with regional head office. Manager Administration Required, Maintain employee’s personal files and records. Profile summary: Should have minimum 6 to 8 years of experience in the field of Administration & Human Resource. Bachelor of Business Administration / Master in Business in Administration is an advantage.